The 2017 Nissan Titan and Titan XD seen here at the Chicago Auto Show aren’t exactly like the ones that roll out of the factory. That’s because these concept models wear several new Nissan accessory parts that customers can buy to customize their truck. On the Titan XD Pro-4X Crew Cab, those add-on parts include a polished exhaust tip, a tailgate guard, a rear bumper step, a bed extender, and a bed divider. The truck also wears a few other custom parts from the aftermarket, including a new suspension from Icon Vehicle Dynamics, new wheels from Method, and new fender flares and sport bars in the bed from EGR. 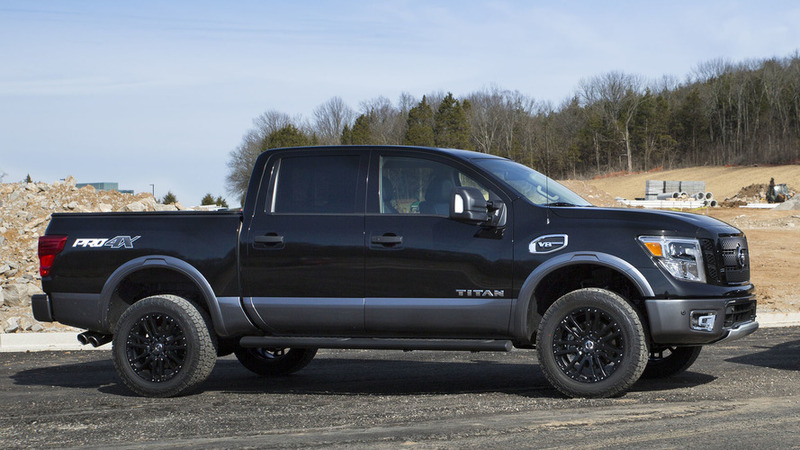 For the smaller Titan Pro-4X, the Nissan-branded accessories shown include a new grille with black inserts, 20-inch wheels, new LED fog lights, a bed box, a tailgate guard, a rear bumper step, and step rails. This truck also wears a handful of prototype parts that aren’t yet for sale, including a prototype of a Nissan Motorsports lift kit that raises the truck’s suspension 1.5 inches in front and 1.0 inch in back, as well as a cat-back exhaust system for the 5.6-liter V8 engine. All these Nissan-branded add-on components are available directly from Nissan dealerships, cutting out the middleman of going to an aftermarket company. 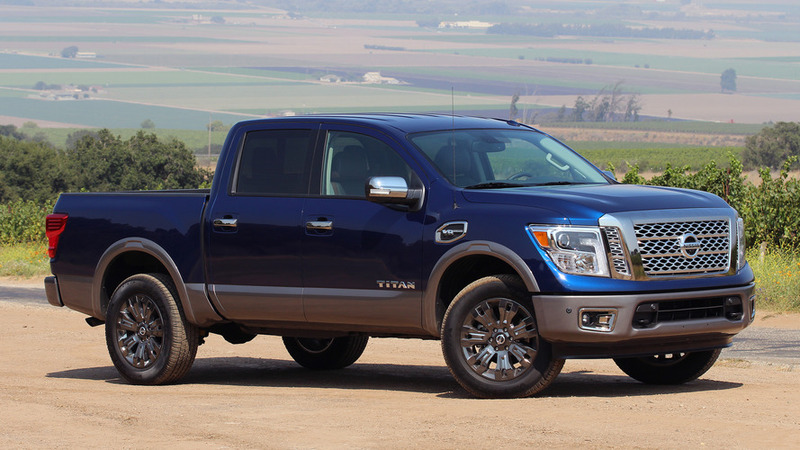 There will be more accessories for the Titan and Titan XD than Nissan has offered in the past for other trucks. That’s in part because Nissan recognizes that truck customers have a big interest in modifying their vehicles. “Customers that buy trucks, they really want accessories, they want to customize their trucks,” says Tiago Castro, Nissan director of sales and marketing for light commercial vehicles. While customers can order parts themselves, the accessories also allow dealerships to create their own models that stand out on lots to potential customers. "Consumer demand is really what's driving that," says Castro. "Our job is to understand that demand and respond to it." 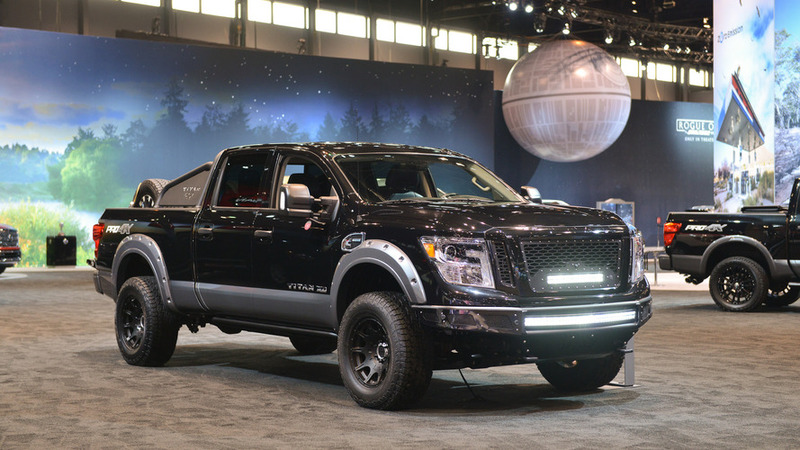 Just as the powerful all-new Nissan 2016 TITAN XD was about to go on sale in late 2015, a highly modified version made its debut at the SEMA show, the epicenter for automotive parts and accessories. Now, Nissan Motorsports is back at the parts and accessories bins again, creating another show worthy modified TITAN XD project in time for the 2017 Chicago Auto Show. The new Motorsports TITAN XD1 will be on display at the auto show, February 11th – 20th, 2017 at Chicago's McCormick Place. The new TITAN XD display vehicle utilizes an array Nissan Genuine Parts and Accessories, current aftermarket accessories and a series of prototype components. "The TITAN XD, with its available Cummins® 5.0L V8 Turbo Diesel engine, is a powerful platform that calls out for customization," said Fred Diaz, division vice president and general manager, North America Trucks and Light Commercial Vehicles, Nissan North America, Inc. "We're pleased to offer TITAN XD owners so many ways to personalize their vehicles and also excited more and more companies are supporting TITAN with aftermarket parts and accessories." Besides a full array of Nissan Genuine components, companies that provided Nissan Motorsports with off-the-shelf and prototype parts includes ICON Vehicle Dynamics (suspension system), Rigid Industries (front grille with camera mount and light bars), as well as N-Fab (front bumper and rock rails), EGR (fender flares and sport bar), Method (wheels) and Hankook (tires). In winter, many truck enthusiasts take to the roads, on- and off-road, not letting a little snow, rain, sleet or ice slow them down. Others take to the parts and accessories catalogs – and garages – to configure and build modified versions of their existing rides. Nissan Motorsports chose to do both, creating a one-off TITAN half-ton truck just in time to hit the streets of Northern Illinois for the 2017 Chicago Auto Show. 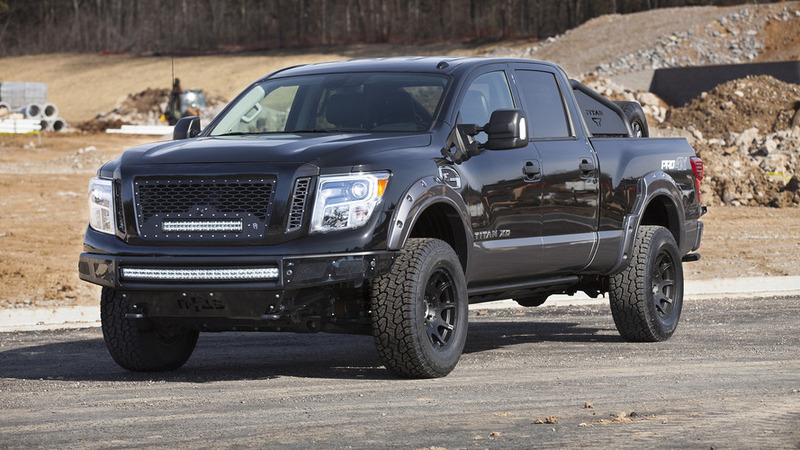 The modified display vehicle1, a Super Black 2017 TITAN PRO-4X Crew Cab, is outfitted with Nissan Genuine Parts and Accessories, along with available aftermarket parts, to give an example of how easy it is to give TITAN a highly personalized appearance, as well as show off what the possibilities could be with a prototype suspension kit and exhaust system. 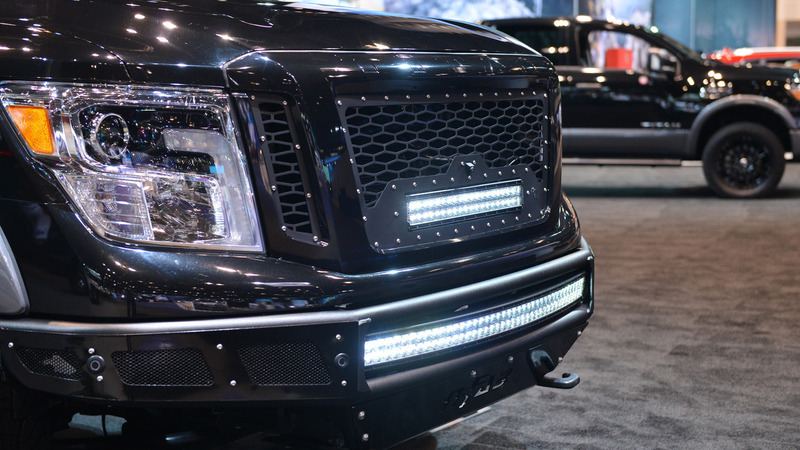 "We want to demonstrate to TITAN owners how they can transform their trucks using parts and accessories that can be readily available through their local Nissan dealers," said Fred Diaz, division vice president and general manager, North America Trucks and Light Commercial Vehicles, Nissan North America, Inc. "And what better showcase for the modified TITAN than in Chicago at the country’s largest auto show." Besides readily-available Nissan genuine components, among the long list of project modifications are a Prototype Nissan Motorsports Lift Kit (1.5" front/1" rear), Prototype NISMO TITAN Cat-back Exhaust System, meaty Hankook Dynapro ATM 285x55R20 tires and Trifecta tonneau cover.